Amazon Price: $203.99 $67.99 You save: $136.00 (67%). (as of October 16, 2017 12:59 pm - Details). Product prices and availability are accurate as of the date/time indicated and are subject to change. Any price and availability information displayed on the Amazon site at the time of purchase will apply to the purchase of this product. 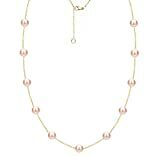 An Nice 18k Yellow Gold Plated Sterling Silver Station Necklace 18" Length with 11pcs of 6-6.5mm Pink Freshwater Cultured High Luster Pearl. Secured With a Lobster-claw Claps, and Have a 2" Long Station Extender for a Longer Look. We Carry Different Pearl Size, Different Pearl Type, and Different Metal Type. Please Contact Us For Detail If You Could Not See What You Need.